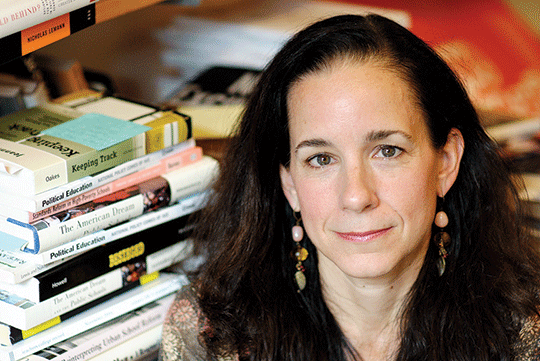 Amy Stuart Wells, a national expert on race and education, begins an appointment as this year’s Wayne Morse Chair with a public lecture Tuesday, Oct. 18. Stuart Wells, a professor of sociology and education at Columbia University, will discuss “Our Children’s Burden: How Public Education Helps Sustain a Diverse Democracy” at 7 p.m. in Room 175, Knight Law Center. In addition to her public lecture, Wells, who serves as coordinator of policy studies at Columbia University’s Teachers College, is co-teaching a class in the UO College of Education and participating in panel discussions there and at the School of Law. Stuart Wells was chosen as Wayne Morse Chair in conjunction with the Wayne Morse Center’s 2015-17 theme “The Future of Public Education.” Her writing focuses on issues of race and education, specifically educational policies such as school desegregation, school choice, charter schools, and tracking and how they affect opportunities for students of color. For more information, visit waynemorsecenter.uoregon.edu and watch the UO Today interview with Amy Stuart Wells.